Philip Johnson ’27 (’30), B.Arch.’43—the celebrated architect of the former Four Seasons restaurant in Manhattan’s Seagram Building, the AT&T Building (now 550 Madison Avenue), and his own Glass House residence—grew obsessed as an undergraduate by Nietzsche’s vision of super-men who could transcend morality to live life as art. His own life, as written in Dallas-based architecture critic Mark Lamster’s new biography, The Man in the Glass House: Philip Johnson, Architect of the Modern Century, reads like an Ayn Rand plot rewritten by Henry James. Not only was Johnson born into wealth (his father was the first legal counsel for Alcoa) and blessed with a handsome face, he had connections to high society and a gift for charismatic self-marketing that repeatedly saved him from his own worst transgressions. The most serious of these, sympathizing with the Nazis and working to bring about a kind of American fascism throughout the 1930s, would dog Johnson throughout his life, even as his powerful friends did their best to keep such rumors in abeyance. Lamster is unequivocal about these charges: the full evidence shows Philip Johnson was “an unpaid agent of the Nazi state”—unpaid only because he was so rich he didn’t need German money. Nevertheless, Johnson died in bed of natural causes at age 98 in 2005, a revered if controversial member of a profession he had helped transmute into high art: proof that money and charm can conceal all manner of sins, and perhaps buy more than one’s fair share of happiness as well. Why is it worth arguing about Johnson? Both his detractors and his devotees agree that his influence was vast. As a young man who lucked into a job after college as the Museum of Modern Art’s first architectural curator (largely through society connections), he defined and popularized the International Style—the potpourri of European modern architectural approaches that molded the look of the mid-century United States. Having built that god, he smashed it and set up a new one: a “postmodern” architecture that threw together stylized gestures toward the non-functional features (like a “Chippendale” pediment atop a skyscraper) that canonical modernism eschewed. Moreover, his wealth and connections allowed him to play kingmaker in the field: a partial list of architects and artists appearing in Johnson’s circle through the decades includes I.M. Pei, M.Arch. ’46, Ar.D. ’95, Andy Warhol, John Cage, Merce Cunningham, Jasper Johns, Denise Scott Brown and Robert Venturi, Ada Louise Huxtable, professor in practice of architecture and urban design Rem Koolhaas, Daniel Libeskind, Zaha Hadid, and Frank Gehry, Ds ’57, Ar.D. ’00. Johnson poses with a model of his highly controversial, postmodernist, Chippendale-topped AT&T Building, May 1978. Influence acknowledged, the further question is whether that influence on architecture was for good or for ill—and whether the history of Johnson’s political beliefs affects that question. Lamster (who teaches at the University of Texas at Arlington and was a Loeb Fellow at the Graduate School of Design in 2016-17) unequivocally condemns Johnson not just for sympathizing with the Nazis, but actively providing them with material support in the 1930s. He left the curatorial job at MoMA that had made him an art-world darling in late 1934 to become a populist rabble-rouser. Some previous biographers and scholars, following Johnson’s own lead, have tried to brush off these years as misguided dalliances, or the common anti-Semitism of the times. They will have a hard time ignoring Lamster’s eye-popping, well-footnoted catalog of Johnson’s activities. He approached Huey Long to offer his marketing services, and was refused mainly because of his own bumbling; later, he designed a Nazi-reminiscent dais for one of Father Coughlin’s rallies. He ran unsuccessfully for the Ohio legislature on the ticket of his own political party, which was “composed of hard-core reactionaries, pro-Nazi German-American Bundists, Klansmen, and members of the Black Legion.” (Johnson’s secretary later told the FBI that he had delusions of becoming “the Hitler in the United States.”) He traveled to Germany in 1937 and 1938; on the second trip, he enthusiastically attended one of the Nuremberg rallies. After his return, he continued to contact Nazi agents until 1940. Johnson was gay in about as public a manner as was possible at the time, but seems not to have noticed how the Nazis treated homosexuals. This was no youthful error: Johnson was in his early thirties. He returned to Harvard (where, as an undergraduate of means at loose ends, he had taken seven years to finish his degree) to enroll at the Graduate School of Design in 1940, out of a dawning sense that fascism was excluding him from polite company and he had no future in politics. Before this, Johnson’s only practical design work had been as an interior decorator; his main credentials for admission were his years at MoMA and his social pedigree. His fortune compensated for his lack of technical skills (he financed the building of an entire house in Cambridge to fulfill his “practical experience” requirement), and he entered the profession after taking his degree, with enough of the fascist stain laundered to become presentable again. He even briefly enlisted in the army (which, aware of his activities, kept him away from any real responsibilities). It is unclear whether he came to realize the Nazis were evil, or whether he abandoned them from a sense of self-preservation. If we accept that Johnson was an enthusiastic fascist in the 1930s, how should we look at his buildings? Lamster treats this biographical problem in a nuanced way. No one thinks a former Nazi sympathizer’s building morally corrupts all who gaze upon it or pass through it. No one seriously thinks we should tear down the landmark Seagram Building Johnson built in the 1950s with Mies van der Rohe, or demolish the Glass House. Lamster, however, pays careful attention to how aspects of buildings throughout Johnson’s career start to look disturbing in light of what he once believed: the “authoritarian pomp” of the New York State Theater, the bunker-like art gallery on the Glass House estate, a possible citation of a pogrom-ruined village as the inspiration for that house’s central chimney. He voices unease with Johnson’s fawning attention to rich and powerful clients, and lack of apparent interest in broader social responsibilities. A lack of allegiances does not necessarily make a bad artist, but it might explain some of the unevenness in Johnson’s work as an architect and designer. Lamster sketches roughly four phases in Johnson’s career: early years as a devotee of Mies (the Glass House, the Seagram Building), then an apostatical turn toward a kind of neoclassicism (the Brick House, the Lincoln Center pavilion) that eventually became his notorious “postmodernism” (the AT&T Building, One International Place), and a final period of decline, “churning out boring corporate towers.” The good buildings are very good, but there are many more bad ones. It is as enjoyable and informative to read Lamster’s descriptions of the buildings he loves as it is of those he hates. Of the Lincoln Center pavilion: “One of the most pleasing public spaces in the city, with spokes and concentric circles of travertine emanating from a dancing central fountain.” But of NYU: “Washington Square managed to survive Johnson’s architecture and remain a vibrant place.” Candid judgments of any kind are a useful improvement on the only previous biography, Franz Schulze’s Philip Johnson: Life and Work, which was completed during the architect’s lifetime (albeit without direct supervision), and avoids being too critical of any single building. Johnson is a maddening protagonist: his comeuppance never quite came. He had few original ideas, freely acknowledging that he liberally borrowed others’; he had a nasty habit of discarding people as soon as they were no longer useful to him; he was convinced he was a world-historical figure. He became a famous architect through an ability to sell his vision of himself as a great architect to others—and his ability to bankroll his own projects. Lamster repeatedly compares Johnson to two famous non-architects. One is P.T. Barnum. The other, Johnson’s final major client, was also born into money, which insulated him from failures that would have ended others’ careers. His sense of personal grandeur and charisma, as Lamster notes, have also carried him through accusations of a racist past into great success. His opponents and supporters alike acknowledge his influence. 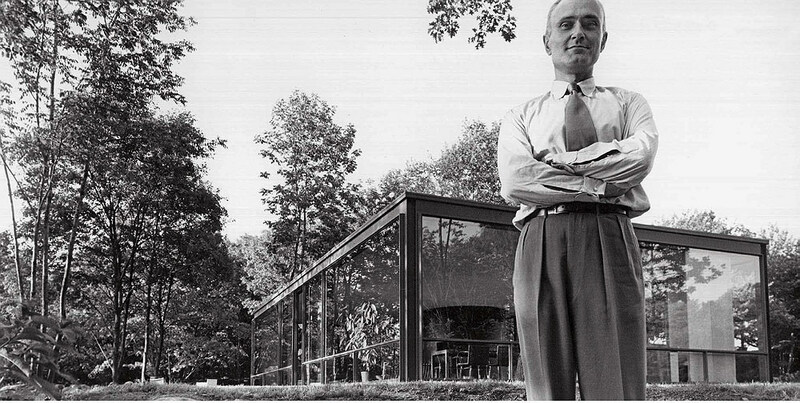 Philip Johnson ended his career building for Donald Trump. Contributing editor Spencer Lee Lenfield ’12, currently a doctoral student in comparative literature at Yale, profiled literature scholar Deidre Lynch in the January-February 2017 issue.